The energy community was looking with particular interest to the latest, just released July OPEC monthly report, for signs of the promised - if only by Saudi Arabia - boost in oil output, and it got what it was looking for, if to a lesser extent than some had expected: in June, OPEC's collective oil production rose by 173Kb/d to 32.327MM, according to secondary sources. While the total production rose to the highest level in months, it was well below both year end 2016 and 2017 production, both of which were above 32.6MM as a result of production declines and stoppages among some key OPEC members. In June, Crude output was boosted mostly in Saudi Arabia, where it increased by over 400K to 10.420mmb/d, with Iraq, Nigeria, Kuwait and UAE also increasing their monthly production. On a self-reported basis, Saudi said it had boosted output by 459kb/d, bringing the total to 10,489mmb/d. 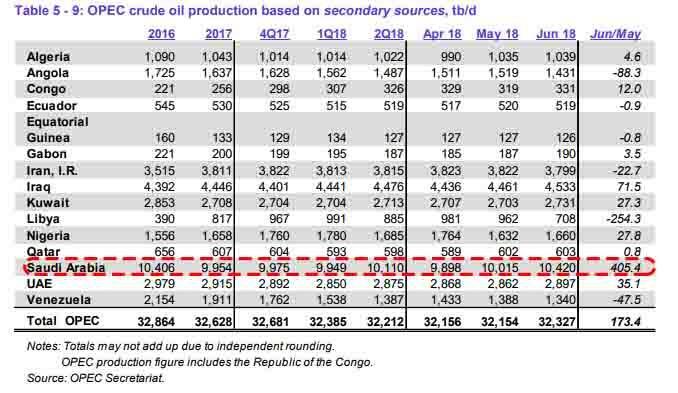 Meanwhile, production declined in Angola as well as the two more troubled nations Libya, which has recently seen a sharp drop in output due to political infighting, and Venezuela, where the nation is grinding to a halt due to the ongoing economic collapse. That said, Libya may soon be returning to peak production with the NOC announcing overnight it had regained control of Eastern oil ports, with operations set to resume to normal levels “in a few hours." Elsewhere in the report, OPEC's 2018 global oil demand growth forecast remained unchanged, forecast to increase by around 1.65mln bpd to average 98.85mln bpd. In 2019, initial projections indicate a global increase of around 1.45mln bpd, with annual average global consumption anticipated to surpass the 100mln bpd threshold. 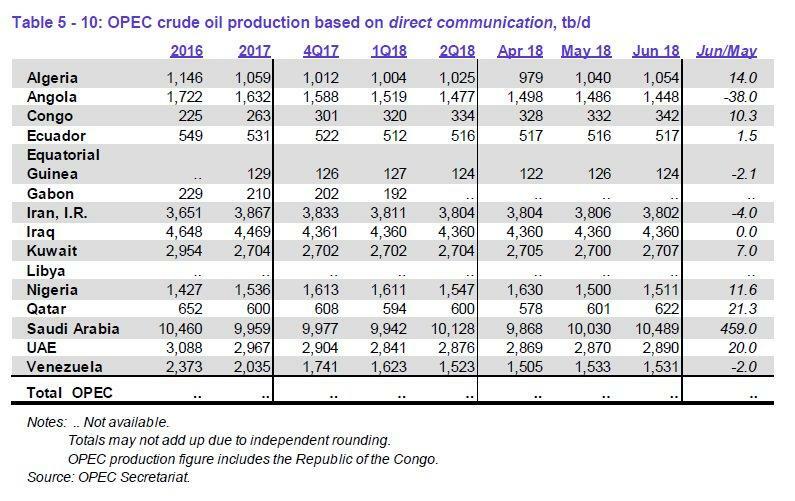 Non-OPEC oil supply (now excluding the Republic of the Congo) in 2018 was revised up from the previous MOMR by 140k bpd to average 59.54mln bpd; an increase of 2mln bpd Y/Y. OPEC also cautioned that U.S. refinery runs may drop from near-record level in coming month amid strong gasoline inventories, something we have seen in practice in recent weeks. "High gasoline inventories and weak refining margins, despite positive performances in the bottom of the barrel, are most likely going to pressure refinery runs from the current high levels in the coming month." The report also noted that US oil products market in June showed “substantial losses” amid high crude prices and lower gasoline demand, and added that refinery margins declined in June because of lower gasoline demand, high crude prices and narrowing WTI/Brent spread. The report also observed that U.S. crude intake levels almost hit record levels, leading to higher product output, further pressuring product markets with demand lower than expected; meanwhile refinery utilization rates increased in June to average 96.9%; thoughput at 18m b/d, up 837k b/d m/m. Finally, addressing the most critical outstanding issue, whether supply can meet global demand, OPEC said that there is enough "rival" supply to meet 2019 demand, when OPEC sees "rival", i.e. shale, supply to meet demand growth. In other words, OPEC is happy to abdicate the title of the marginal oil producer to the US. Whether shale can take advantage of this will determine whether oil continues to surge in the next year, or once again tumbles. Meanwhile, if oil indeed hits $150/bbl as some have predicted, the outcome will be simple: recession, which will be the surest, most effective way of sending oil prices lower.